There is a widespread perception that even in times of severe financial constraint, when staff below management level are unlikely to see much in the way of pay movement, Managers continue to benefit from increases in remuneration which widen pay margins between levels. The MHR Executive Pay Index (EPI) monitors the relationship between Executive remuneration and General Staff remuneration by expressing Median Total Remuneration for selected CEO roles and all Top Executive roles as a ratio of General Staff Median Total Remuneration. Median rates are us ed to calculate the index, as these reflect the middle of the range for each group, thereby avoiding any skewing from extreme payments at either end of the range for each sample group. 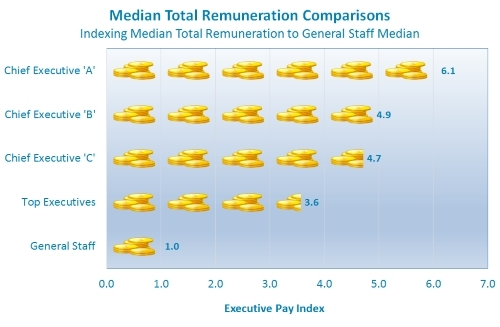 The index value means that the Median Total Remuneration for Top Executives in 2014 is 3.6 times that for General Staff. In essence, should the common perception hold any validity the index for each group should get progressively higher year on year, as Executive rates rise and General Staff rates move more slowly. Contrary to common perceptions, the index for each of the four groups compared has remained remarkably stable, showing only minimal change over the past ten years, as shown here. The one exception is for Chief Executive ‘C’ between 2005 and 2007, a period in which Pubic Sector CEO rates were being more closely aligned with those in the Private sector. 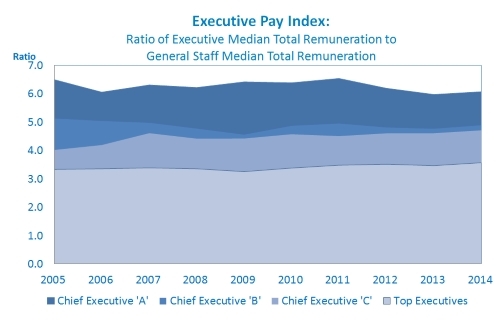 That exception aside, while there are minor changes in the “landscape” from year to year, the ratios between Executive remuneration and General Staff remuneration in 2014 are little different to the ratios seen in September 2005. This suggests the common perception of “ever growing” executive remuneration is based largely on generally negative media comment about a small number of highly visible roles, and bears little resemblance to the reality of practice in the wider market.